Tape required during assembly is not included. If desired, this tape can be removed afterwards, as the LEDs are firmly lodged into the panel when assembly is complete. 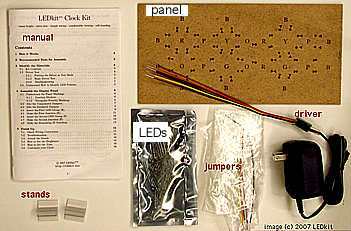 The kit includes 6 spare LEDs — just in case you accidentally break some LEDs during assembly. Get your kit now! No expensive tools are required. Just push the LEDs into the predrilled holes in the included panel. Tape the included wires onto the panel and twist them together with the LEDs. Plug it in, set the time, and voila!